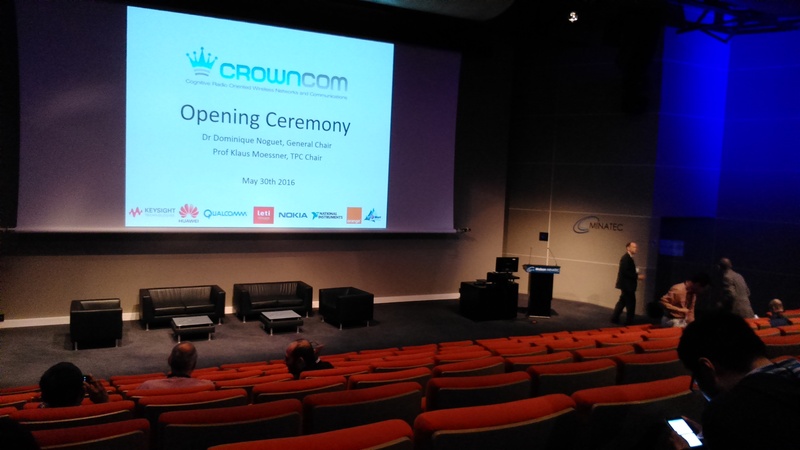 Last week of May, I attended the Conference on Cognitive Radio Oriented Wireless Networks (CROWNCOM 2016 – http://crowncom.org/2016/show/home) in Grenoble, France. And as I found it very interesting, this time I would like to share a conference summary in the below article. Even though most of the talks were around sensing schemes, modeling, theory, HW and PHY, the discussions covered also aspects related to regulatory, business models, and sharing schemes, especially in the context of LSA (EU) and Three Tier Model (US). “5G” was present in the air, where the importance of the 3 spectrum licensing schemes including license exclusive, license shared and unlicensed usage was brought to attention. To get a little bit more feeling on what were the topics discussed during the 3-days of the conference, below there’s my subjective take on various fields. One of the interesting aspects related to the dynamic spectrum access operation, with the “Sensing-as-a-Service” approach, where the infrastructure is responsible to provide information on whether the shared spectrum is available for use by licensee/GAA. In this model, a database that the device can query for the availability of the spectrum to be used based on the device location, plays a central role. In this case, the “good old” CR sensing can be a supporting mechanism for the database centric approach. Flexible access by means of spectrum sharing with the support of of LSA or Three Tier model was one of the most important topic discussed by the different regulatory bodies. Regarding 5G, the important bands include 28GHz (especially for US), whereas in EU 700MHz seems to be crucial. European Comission (EC) provided us with their view on the “5G-ready telecom rules” for EU including: promoting flexible access (by means of more general authorization, hybrid licensing models and increase protection of unlicensed users); improving timeliness of spectrum availability; and promoting rapid rollout of high performance networks (e.g., by promoting network and spectrum sharing in strategic areas). Spectrum sharing is then seen as a tool to facilitate innovation. Ofcom presented tiered authorization approach including: tier 1 – existing license classes (p2p links), tier 2 – geographic based license layer, and tier 3 – opportunistic license layer (operating on geographical areas where other tiers are not using the spectrum in an almost unlicensed manner). The big vendors discussed 5G-related spectrum access and recent results on LSA and co-sharing models (including trial results). Additionally, they were accompanied with business models evaluation. The envisioned main sub-6GHz bands for 5G include for the first step: 700MHz, and 3.4-3.8GHz; and in the second step: 3.8-4.2GHz (the latter ones are important mostly due to having large contiguous blocks of spectrum). The two main sharing approaches for 5G include: license exempt with no regulatory guarantees; and licensed shared with predictable sharing conditions guaranteed by the authorities. In the other end, a new approach for LPWA market was presented with the use of multi-antennas for lower power devices with the use of CR/SDR-based mechanisms including interference cancellation and beamforming performed on the network side (“in the cloud”). The current “hot” aspects within the dynamic spectrum access domain include the combination of the CR with the machine learning mechanisms. One of the examples of combination cover the “legacy” sensing mechanisms with the addition of database support and prediction mechanisms that help to improve energy efficiency of the devices. 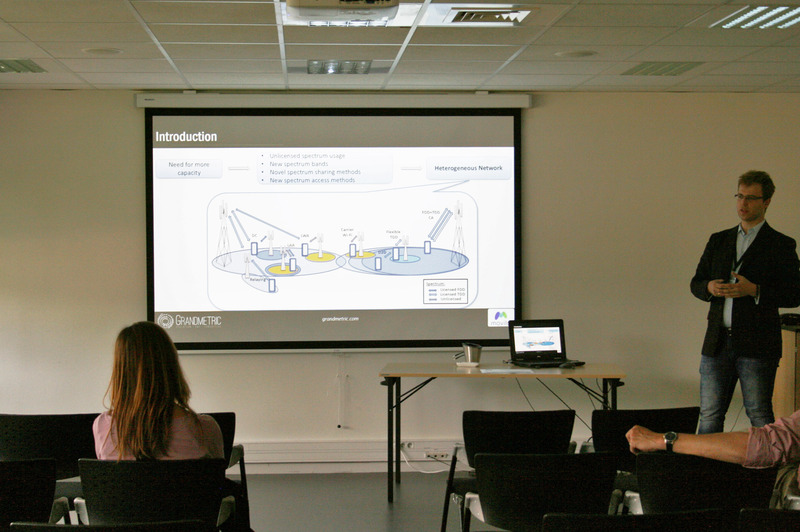 An ICIC-scheme for HetNet with the sensing support was also presented as an example application of CR mechanisms in cellular networks. The interference estimation algorithm is initiated by the “legacy” geometry based measurements and then its fed with the UE sensed data, being a semi-deterministic map including both, statistics (e.g. channel parameters and base station distribution) and deterministic information (e.g. indoor/outdoor status UE). This is based on the assumption that we don’t know the eNB positions apriori, e.g. an operator that doesn’t know the position and ON/OFF status of femto cells at end-user premises. An interesting topic was also raised regarding trust in the context of the licensed shared schemes. As we tend to focus on protecting the incumbent, by means of the incumbent’s trust towards the licensee, in fact it the trust goes in both directions. Spectrum sharing requires incumbents’ and entrants’ risks evaluation and trust models for the whole framework to work. A little aside from the main track of the conference that was focusing on spectrum sharing, spectrum access etc., there was a very interesting CLEEN Workshop gathering latest results from the H2020 phase I projects. 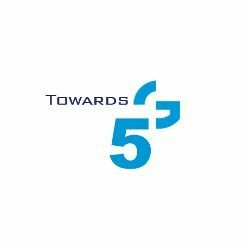 Here we could listen about SDN and NFV concepts as well as architectural considerations targeting 5G design. 5GNORMA presented their contribution to energy efficiency by means of the following aspects: network virtualization (unification of different RATs, reuse/reduction of equipment), cloud networking (sharing of commodity HW, centralization that reduce need for air conditioning), network slicing (enabling infrastructure sharing and separating higher layers from NW infrastructure) and software-ization of control plane (energy optimization, flexible multi-service support). deployment of edge GWs (Control- and Forwarding planes) to geographically distribute resource control and access to service content. common RRM: dealing with resource allocation and inter-cell cooperation (linked to spectrum management aspects for operating in shared spectrum bands). As a summary of the above, I would like to share with you the conclusions from the joint work of Grandmetric and Movilo, entitled “Spectrum Toolbox Survey: Evolution Towards 5G”, I had a pleasure to present during this conference. a very flexible and dynamically handled access with the mix of the above and addition of high frequency bands and various spectrum licensing schemes and dynamic spectrum sharing. 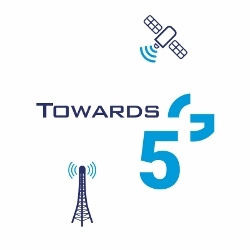 this an similiar conferences will become more and more important in the context of cellular communications bringing CR closer to it to help 5G happen. How do satellite systems fit into 5G?